This panel enables the creation and modification of teams. If a team has been defined, you can edit it by clicking on the team name. To create a new team, just press the “Add Team” button in the panel shown in the image below. That provides a pop-up dialog for you to put the name and description of the team. Press the “Create” button in this dialog and you will create the team. Click on the Team name to be directed to the Teams Dashboard. From here you can remove members of the team by clicking the "X" next to the person. You can add new members of the team using the “Add User” button. Note also that you can also completely remove the team by clicking the “Delete Team” red button at the top of the panel. This panel enables the creation and modification of teams. If a team has been defined, you can edit it by clicking on the team name. To create a new team, just press the “Add Team” button in the panel shown in the image below. 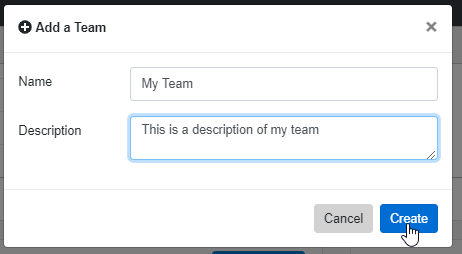 That provides a pop-up dialog for you to put the name and description of the team. Press the “Create” button in this dialog and you will create the team. Click on the Team name to be directed to the Teams Dashboard. From here you can remove members of the team by clicking the “X” next to the person. You can add new members of the team using the “Add User” button. Note also that you can also completely remove the team by clicking the “Delete Team” red button at the top of the panel.